After a holiday break that gave much of our staff a well-earned reprieve from the daily news along with some cozy time with loved ones, we are happy to be back and starting a new year. Some of our team spent the holidays in far-flung places like Berlin and the U.S. Virgin islands, while others used the extra time to venture into the West’s winter wonderland. Editor-in-Chief Brian Calvert (almost) figured out how to fit both his dogs into a skijoring rig so they can drag him through the Colorado mountains. Associate Editor Maya L. Kapoor took a backpacking trip to Point Reyes, California, where, thanks to the government shutdown, visitors were forced to bushwhack to nearby creeks to filter water, as water stations had been shut off. And Associate Photo Editor Luna Anna Archey went hiking in the sandstone canyons of Utah’s Capitol Reef National Park, after finding both Arches and Canyonlands closed. At Capitol Reef, Luna saw a “saintly park ranger still working and taking out trash.” Thank you, ranger, for your service. HCN’s new intern, Nick Bowlin, is looking forward to skiing in the mountains surrounding Gunnison, Colorado. Back in Gunnison, our editorial staff welcomed Nick Bowlin, our newest intern. Nick formerly worked as a politics reporter for Energy and Environment News (E&E News). He took three days to drive in from the East Coast, which gave him just enough time to listen to The Odyssey before he starts his own at the magazine. 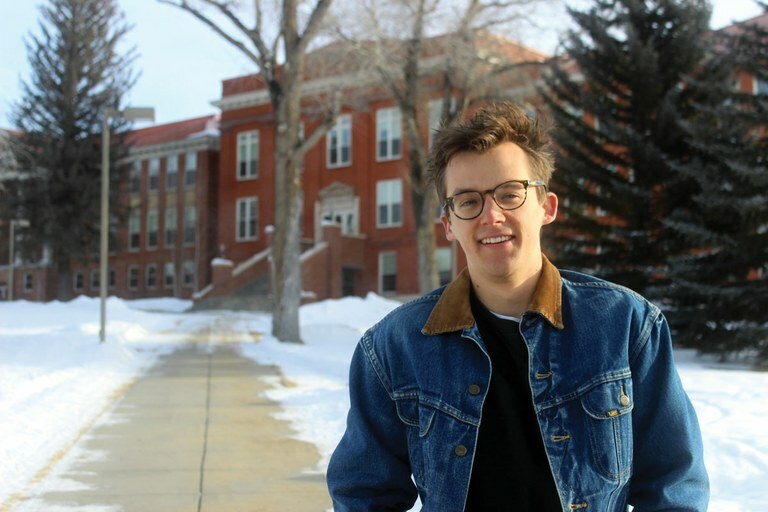 Nick started his journalism career at St. Olaf College in Northfield, Minnesota, where he majored in political science and edited the school newspaper. After a short stint at a daily newspaper in the Philadelphia area, he then moved to Washington, D.C., where he polished his reporting skills and delved into the money politics that govern national energy and environmental policy. He’s “very excited to write about energy development and public lands in the West” for HCN, he said, and we are very excited to make use of his expertise! Meanwhile, readers Bruce Baird Struminger and Isabel Constable stopped by our headquarters in Paonia, Colorado, and left us some juicy story tips from their home state of New Mexico. Thank you both! Speaking of tips: Assistant Editor Paige Blankenbuehler is opening an investigative reporting project examining home insurance and wildfires. If you or someone you know has experience dealing with post-fire insurance claims and would like to share, please send an email to [email protected]. Discretion assured. Finally, a correction and a clarification from our “Good News, Bad News” special issue (HCN 12/24/18). In “Blooms in the Desert,” we described The Colorado Sun as a nonprofit; in fact, the venture is an LLC. In “Patty Calhoun has hope,” we failed to disclose a prior working relationship between Calhoun’s Westword and the writer of the story. We regret the errors.